“America faces a new and uncertain landscape,” Peterson said — noting the challenges and opportunities related to our nation’s fiscal and economic outlook. While our nation is still recuperating from a politically turbulent election year, Peterson said, the economy is evolving and a new president and Congress are pursuing an ambitious legislative agenda. 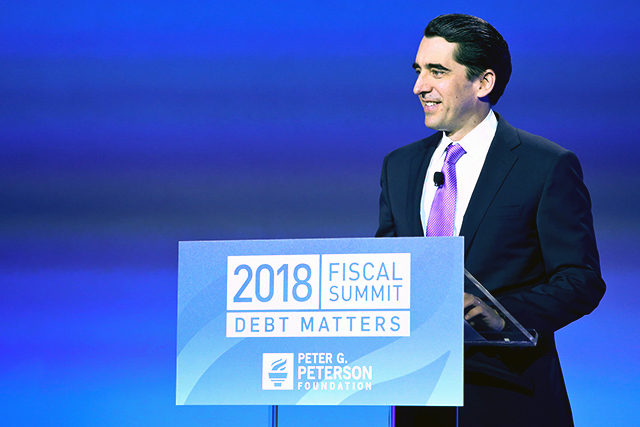 Peterson outlined the fact that all of the major reform proposals under consideration by lawmakers will impact, and are impacted by, the national debt. Given that 70 percent of the spending growth in our major entitlement programs is for healthcare, addressing the U.S. healthcare system is essential to improving our fiscal outlook. Tax reform can have a significant and direct effect on our fiscal path, making it far better or far worse. While many agree that there is a need to address our infrastructure, there is considerable uncertainty surrounding our ability to pay for it given our growing debt and interest burden. And as America’s work- force adapts to globalization, the national debt threatens our economic growth and leadership role in the world, Peterson said.